Let's All be Adventurers This Year. | The girl who loved to write about life. Adventure can be overwhelming to think about, because it can seem like you have to spend all the money and use all the vacation days and travel far away and spontaneously wake up one day and say "screw the deadlines" and quit your job in order to have it. And that's just not true. To me, adventure is a state of mind. You can have the best adventure ever sitting still on your couch--just ask anyone who's ever read a good book. Sure, some of the best adventures cost money and require planning or rearranging your life, but some of the best ones don't. Adventure isn't about going and seeing and trying new things every single day. I love having plans to do fun things, love going new place, love trying new things. But I don't want to do that every day...I mean, sometimes you just want mac and cheese for dinner while you're wearing sweatpants, you know? That's what adventure is to me. It's building a life that you love. It's dinner at the new French restaurant on Saturday and eating mac and cheese in your sweatpants on Sunday. Adventure is choosing to explore. It's not about building a brand new life that you no longer recognize, it's about exploring with your own life, in your own town. Cheers to more adventure. To trying new things. To more failures and more successes. To more Netflix nights and more nights outside under the stars. To trips across the country and to exploring your home town. To spontaneity and to planning. To staying up way too late and to taking time to rest. See, adventure isn't about only doing one type of thing. It's about building a life full of all the things you love. 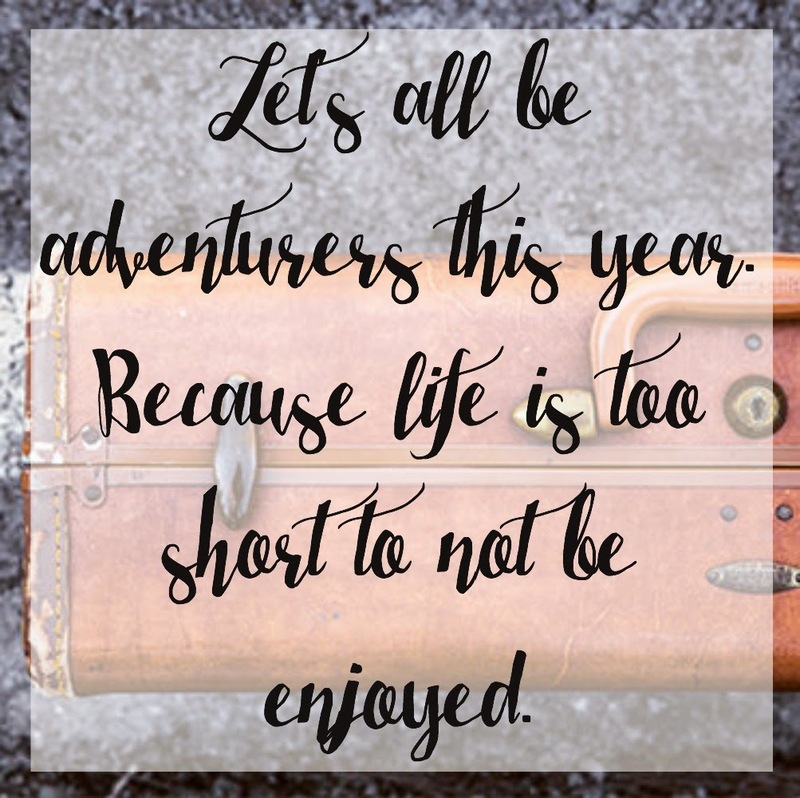 So let's all be adventures this year. Because life is too short to not be enjoyed. Love the way you define adventure...you definitely don't need to travel the world every day to cultivate an adventurous spirit! You so right! Life is all about balance and can live your big dreams in small ways. P.S. I'm have a Link-Up on my blog and wanted to invite you to it. Thanks! adventure is really everything. love this! I love this! Life is about adventure. Mac and cheese can definitely be an adventure :) Love this post -- I needed the encouragement! I'm ready to jump into adventures! Hmmm...this might even be a great link-up! "Weekly Adventures!" I agree that adventure isn't all about dropping your life and running away to Thailand. You can adventure across the world or you can adventure in your own backyard. Love this!! So so true! You are the most talented person I know. I love your blog. I know you are a young woman & I'm quite a bit older. You had the insight to teach me about adventure (& many more things). I am going to start practicing this one immediately. Then I'm going to go back through your posts & see what I have really missed. This is so exciting. This is going to change my life! Thank you so very much! Absolutely love love love this post!! I was actually just venting to my coworker how people tend to say they want to do things in life, but don't take the initiative to do them. Beautifully written :) I think a lot of this is the basis of my next 101 in 1001 list, so many things to do in my own life + town that I haven't tried yet.